After a weekend of claims by US President Donald Trump that he has the upper hand in the trade war with China, Beijing responded through state media by saying the nation is ready to endure the economic fallout. The exchange of barbs between the two sides follows the release late Friday in Beijing of a new tariff list designed to retaliate against the US threat to impose new duties on $200bn of Chinese imports. The worsening of the tension comes amid a slowing of China’s economy, declines in the currency and a bear market in stocks. “We have really rebuilt China, and it’s time that we rebuild our own country now,” Trump said Saturday during about an hour of free-wheeling remarks at a rally outside Columbus, Ohio. China’s market declines weaken that nation’s bargaining power in the escalating trade war, he added. Trump continued his focus on tariffs Sunday morning, tweeting that the duties are working “big time” and that imported goods should be taxed or made in the US. He also suggested duties will allow paying down “large amounts of the $21trn in debt that has been accumulated” while reducing taxes for Americans. The yuan extended gains following a rally triggered by a surprise China central bank move to make it more expensive to bet against the currency. Asian stocks advanced Monday. China stepped in Friday to try to cushion the yuan after a record string of weekly losses saw the currency closing in on the key milestone of 7 per dollar. 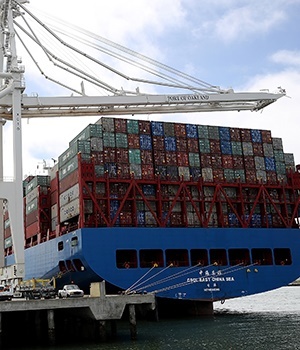 Duties ranging from 5% to 25% will be levied on 5 207 kinds of imports from America if the US delivers its proposed taxes on another $200bn of Chinese goods, the Ministry of Finance said in a statement on its website late Friday. President Trump last week ordered officials to consider imposing a 25% tax on $200bn worth of imported Chinese goods, up from an initial 10% rate. The move was intended to bring China back to the negotiating table for talks over US demands for structural changes to the Chinese economy and a cut in the bilateral trade deficit, but China’s response suggests that tactic hasn’t worked.